When Josephine Ivy has her hair brushed by her in-home personal care worker, it’s done with love. That’s because Ivy’s caregiver is her daughter, Unity Brown, who is a paid caregiver for her mother 22 hours a week. She does this through a Family Care program known as Self- Directed Supports, in which Family Care members can get the care they need from the people they’re most comfortable with. “It’s a blessing,” Brown said of being paid for some of the hours she cares for her mother, who is a member of My Choice Family Care. The self-direction program offers a lot of options for members, says Jane Westpfahl, a Self-Directed Supports Specialist with My Choice. Through the program, a member can choose who provides care or services to them. That’s why it’s called “self-directed.” “It’s a more creative way to provide services,” Westpfahl said. Members can have a relative, friend or neighbor paid to provide care or services if they feel more comfortable working with someone they know, rather than with a staff person from an agency, Westpfahl said. Family members also appreciate that their relative is getting care from someone who loves them and knows their needs. “There’s a sense of relief and satisfaction,” Brown said, because she’s familiar with her mother’s specific medications and can easily keep her safely on schedule. If a caregiver needs training to provide the services, that training is provided to them free of charge. Whether or not the caregiver requires training is determined on an individual basis. The key is making sure the member is safe, Westpfahl said. My Choice Family Care works with several agencies who provide the training, collect the time sheets and send the paychecks to caregivers. These agencies handle all the paperwork and also provide respite workers as needed. Respite workers are available if a caregiver needs a break or wants to go away on vacation. Meanwhile, Ivy enjoys having her daughter help with cooking, cleaning, bathing, laundry and errands. “We spend more time together, and we talk a lot,” she said. 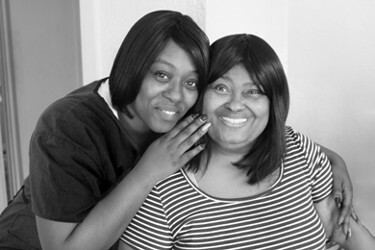 Before Brown took over her mother’s care, her older sister, Shalonda Buchanan, worked with Ivy as a personal care worker. “I was happy they’d be my caregivers,” Ivy said. “I’m a little spoiled. It feels good,” she said, smiling. Caring for Josephine is a family affair: her son, Tommy Ivy, lives with her, and helps out as well. Ivy said without the care from her family, she probably wouldn’t be able to live as independently and stay as healthy. “I do what the doctor tells me to do every day, and she makes sure I do it, too,” she said, pointing to Unity. “Our goal is to try to keep a person as independent as possible, and the goal for many people we serve is for them to stay in their home as long as possible,” Westpfahl said. Both mother and daughter say the self-direction program that allows a loved one to care for their parent is extremely helpful. For more information about long term care options in Milwaukee County please call the Milwaukee County Aging Resource Center at (414) 289-6874 (for those age 60 and over) or the Milwaukee County Disability Resource Center at (414) 289-6660 (for those age 18 and over with disabilities). For more information about My Choice Family Care please call (414) 287-7600 or visit mychoicefamilycare.org.